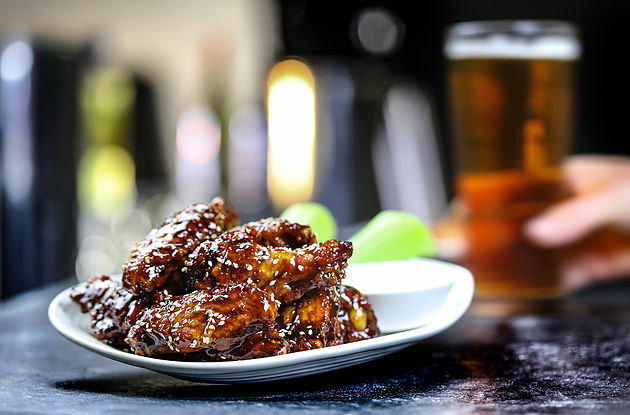 Wing It's prices may not entice you but with ample portion sizes, you're sure to leave full. As I sit waiting for my food, I overhear a fellow punter remark: “It’s pretty intimate for a wing place.” I have to agree with him. Eating at the recently opened Wing It seems oddly counter-intuitive. When I think of chicken wings, I think of a diner in the US where an overworked waitress gruffly brings you and your friends a basket full of wings. Not a suave, dimly lit, bougie restaurant on George’s St. As I look around, I muse to myself that Wing It is the equivalent of trying to pass Willie Nelson’s music off for smooth jazz. Nevertheless, the decor does make me feel at ease. Natural light floods in from a skylight. Minimalist mirrors adorn the walls reflecting back a blotchy image of myself. The speakers are playing Stevie Nicks. The space is narrow, making the whole experience a little cosier. I scan the menu. I am a man of simple tastes, so I am very familiar with the chicken wing. Being used to the standard unspecified barbecue sauce, I was surprised at the wide assortment of differently prepared chicken wings. They range from the medium buffalo wings, served with “award-winning New York-style buffalo sauce” made with vinegar-aged cayenne peppers, herbs and spices, to the sweet chilli wings covered in mild Fresno chillies, rice wine vinegar, garlic, ginger and sesame seeds, and even tequila and lime wings covered in an “intense lime juice with a round tequila finish” along with mild chillies, brown sugar, pico de gallo and tequila. I decide to opt for the Bootleg BBQ wings, coated in mild Kansas City-style barbecue sauce made of apple juice, molasses, cinnamon and cider vinegar. I also have to choose from three different styles, traditional (wings on the bone), boneless (chicken breasts in cornflour batter) or “vegan chunks”. I stick to the traditional style. The prices irk me slightly and I have to make sure I have enough money in my wallet before ordering. The “main” size is €14.50, which is pretty pricey for my, or any student’s, budget. There is also a starter option, but as this is my dinner, I opt for the main. I decide to get a half portion of the “ultimate fries” (chips sprinkled with cheese and garlic mayo) too – a full portion costing €6.95. When asked if I want a drink I meekly ask for tap water. I’m not made of money. It doesn’t take long for the food to arrive and it immediately explains the prices. My half portion of chips, while delicious, could feed a small village. I count 20 chicken wings on my plate. Along with the food comes a small bucket for the bones – a nice touch. I am not a big eater, so the amount of food in front of me was slightly off-putting, but it was so expensive that I don’t want to leave any behind. By wing five, I realise that there’s no chance I’ll be able to finish. By wing 10, I’m sweating and wondering if it would be bad for me to leave for a smoke to settle myself and then come back to finish the job. By wing 15, there is nothing I want to eat less than chicken wings. I’m almost getting emotional. I tap out. I am absurdly full. The chicken wings are rich and slightly tangy. The chicken is nicely cooked and succulent, the skin slides of the bone and is pleasantly crunchy. I am not mad on the sauce, but that is a personal preference. From an objective point of view, it is very tasty. The fries are nice at the beginning, but as time goes on, and I battle through the pile of chicken wings, the cheese congeals and the chips become soggy. Taking home a doggy bag of leftovers really is not an option. My mentality going into a restaurant is that I would prefer to leave so full that they have to carry me out on a gurney than peckish. But there is a limit to the amount of food served, particularly when the menu is so pricey. If I were to go again, I would choose the starter size, but nowhere in the menu does it indicate how big a main portion is. The waiting staff were efficient but did not exactly make me feel at home. All in all, I won’t be rushing back to Wing It the next time I crave chicken wings.